Our timetable has been designed to maximise learning time and to allow for a fully-enriched curriculum to include both core subjects (English, Maths, Science etc.) as well as foundation subjects (History, Geography, Art etc.). The school gates are opened from 8:40am. The children can come straight into their classrooms as the school day begins at 8:50am and finishes at 3:20pm. 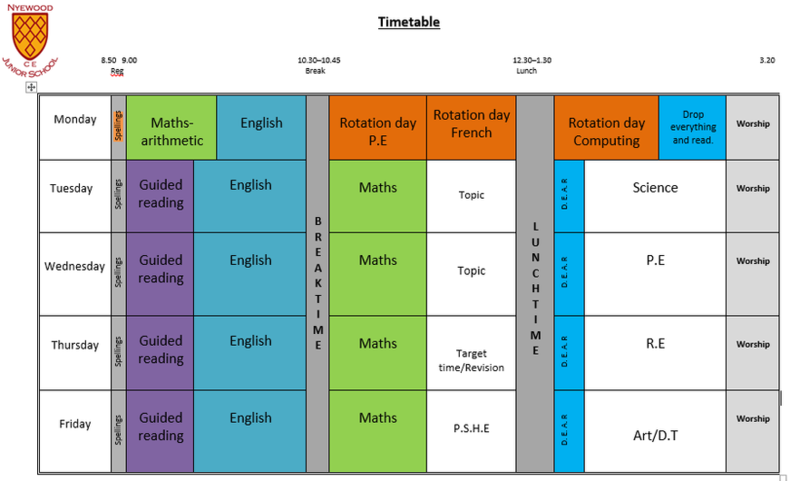 Below is a generic timetable to give you an idea of what a typical week at Nyewood C.E. Junior School may look like (timetables will differ per year group and classes with not all subjects being taught weekly depending on the time of year/topics).